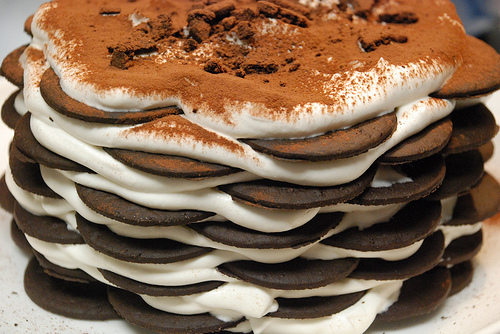 Featuring Nabisco wafers stacked with whipped cream, covered in more whip and set up to soak up the moisture in the refrigerator (aka icebox) overnight. What is not to love? Ice cream, meringue, American history and fire. Named in honor of the incorporation of the Alaskan territory in 1876, the original was not a flambe - however, the common presentation involves the cake splashed with dark rum and set alight. With recipes dating back to the early 1900s, this recipe is an all-American favorite made popular in the 1950s - particularly in the Chiquita Banana Cookbook. Updated with citric acid instead of real phosphate and made more grown up with a twist of bourbon! Combine all ingredients in a highball glass and stir. Popular since the '50s, this Southern favorite is super moist and particularly light and airy from the soda. Preheat oven to 325 degrees. Cream together margarine and sugar until fluffy. Beat in eggs one at a time. On a lower speed, add the flour and the extracts. Gently fold in the 7-Up and flour into a greased 10-cup bundt pan. Bake for 1-1/4 hours. Cool for about 20 minutes in pan before turning out onto wire rack to finish cooling. Dust with powdered sugar.